Now, put on your wine thinking cap and tell me what to drink with these dishes. Hmmm. Okay, I'll play along. For the spinach ravioli, I'd choose a chardonnay, or that lovely organic Charentais white produced by the Lurton Brothers. For the chicken kufta, I'd choose a Moroccan wine, like the "gris de Boulaouane." The beef and sweet potato stew would be good with a lighter red wine, like maybe something made with gamay grapes. I'd choose a heartier red for the moose cakes. For some reason I'm thinking cider or beer would be good with the scones. But not just any beer. It'd have to be a tasty microbrew. I think the pasta and seafood would be tasty with a dry French rosé (NOT a blush wine!) or a light red wine. As for the cookies, I'd suggest a "vin cuit," such as a muscat or banyuls, or a sweet white wine, such as a jurançon. 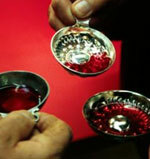 A Brachetto d'Acqui. It would be like the berries on top of your cheesecake and the frizzante-ness would cut through the richness. I'd actually like to dip these cookies in a big ol' trough of Brachetto. Yum! You know, I think a white wine would work nice, like a 2000 Baumard Clos du Papillon. I think any white with some richness, a little bottle-age, and maybe a hint of RS would be nice. Like an Alsatian white. At least I would like to try this dish with my suggestion and also have a bottle of red just for fun. What red? Hmm. A grenache-y Rhone? An old-vine, unoaked Spanish grenache? A Bierzo? I'll try my hand at some wine pairings. For Sage Butter and Spinach Ravioli I'd pair with a crisp Pinot Gris from Otago in NZ. My dish was in actual fact consumed with apple juice... but if i'd had more time to eat it, i would have paired it with a delicious Sangiovese/Merlot by Innocent Bystander (http://www.innocentbystander.com.au), or a NZ pinot noir from Marlborough. For the beef and sweet potato i'd pair it with a nice smooth Cote du Rhone, and the meat cakes with a full bodied Shiraz. The scones im a little stumped on... they are savoury... but wine wouldn't be my first choice of beverage... I'd probably be drinking tea, or a long espresso macchiato. The seafood i'd serve with a crisp Semillon Savingnon Blanc, and the cookies would have to be a sticky dessert semillon botrytis, a nice Satuerne would be great. Thanks again for the link. great site you got here. Great list Beau...Here's my crack at the pinata..
Ali - Good suggestions. I think a Beaujolais Cru with the stew would be an interesting match. I might just give it a try. J- I'm with you on the Brachetto. Very good idea to replace the fruit topping with some frizzanteness. Matt - a PG from Otago is a very nice suggestion. It's a shame most people only think of Marlborough SB when they consider white wine from NZ. BillyZ - I've got a stanky bottle of Beaucastel C d P at home. Now I just need to track down some Moose. Perhaps I'll have to sub in Elk (which I can find around here). Just found out about your site and saw this site. Great, I am going to learn a lot about wine! Thanks for the link and note!